Lloyd Pierce will be introduced as Atlanta Hawks head coach on Monday. 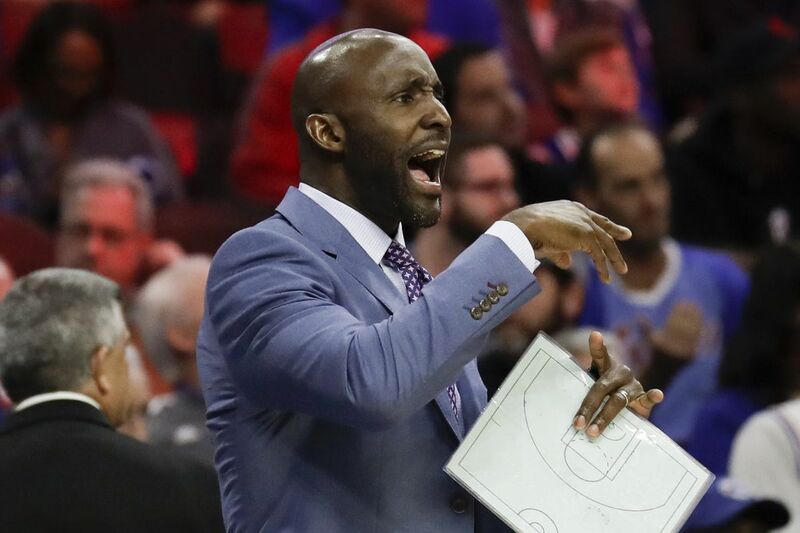 Lloyd Pierce said 'The Process' was about developing much more than players. He spoke of how he developed with the 76ers as an assistant coach since being hired in the fall of 2013. On Friday, his 42nd birthday, he was rewarded, reaching an agreement in principle to become the Atlanta Hawks head coach. Pierce, who will receive a three-year deal, will be formally introduced on Monday. All signs pointed to Pierce being Atlanta's next coach. He met with the Hawks for the third time Friday. That's when it became clear they were going to offer him the job. The meeting was with Hawks officials, including general manager Travis Schlenk. Pierce had an initial meeting with Schlenk last week, then had an informal dinner meeting with Hawks majority owner Tony Ressler on Tuesday in Boston. Pierce told Philly.com on Wednesday that he's a good fit for the job. "The main reason is just looking at their young players," Pierce said. "They've got four guys in the draft. They've got a couple of young players that are on their roster. So what's most important when you are dealing with young players and young talent, it's the development and relationship side of that. "It's kind of my track record. It's anybody's track record of how do you communicate, how do you work with players, how do you develop, what does that mean?" The Hawks tanked this season and finished tied with the Dallas Mavericks for the league's third-worst record at 24-58. After losing a tiebreaker to the Mavericks, Atlanta has the fourth-best odds, at 13.7 percent, of getting the first pick in the draft lottery next Tuesday. The Hawks have a 42.3 percent chance of getting a top-four pick and can end up with no worse than the seventh slot. The Hawks have two other first-round picks — Nos. 19 and 30 — and a second-rounder, No. 33. Pierce, who ran the Sixers' defense, knows how to deal with rebuilding teams. The Sixers won a combined 47 games during his first three seasons, including the team's 10-72 campaign in 2015-16. The Sixers went 28-54 last season before improving to 52-30 this season. "Some similarities to what we went through here. Not all," Pierce said.